Some of the earliest tattoos in history were rooted in spiritual philosophies. 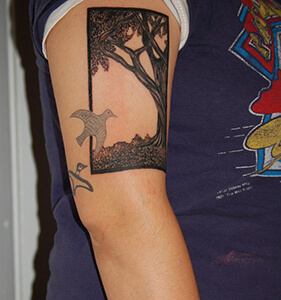 In fact, many important spiritual or philosophical tattoo designs predated organized religion. Once religion became widespread, religious tattoo designs also became popular, and they were worn to show devotion to the faith. If you’re interested in learning more about the meanings behind religious tattoos, check out our list below! 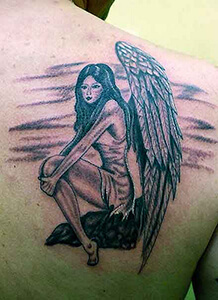 Angel: a prominent symbol in Islamic, Jewish, and Christian faiths, the angel is known as a messenger of God. The design often features a robed, man-like creature with wings, symbolizing piety, spirituality, and faith. Tree: the tree is a strong religious symbols in multiple faiths, representing the interconnectedness of life, strength and resilience, as well as shelter and nourishment. In Buddhism, the bodhi tree is a significant symbol, since Siddartha Gautama, the founder of the faith, was believed to receive enlightenment while meditating under this tree. Anchor: the anchor symbolizes many things, but in Christianity, this tattoo design represents hope, salvation, and eternal life. Cross: in the Bible, Jesus is crucified on a wooden cross. The cross symbol has since become a reminder of god’s eternal love and redemptive power. Dove: in the Bible, the story of Noah’s ark explains that a dove returns to the ark with an olive leaf, signalling to Noah that the waters are about to calm down. As such, the dove has come to represent the Holy Spirit in Christianity. 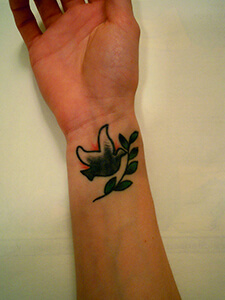 In Greek mythology, the dove was also a symbol of the goddess of love. Om: this mantra, which is pronounced in three separate sounds (a-u-m), represents trinities, including the Earth, the Atmosphere, and Heaven, and Past, Present, and Future. 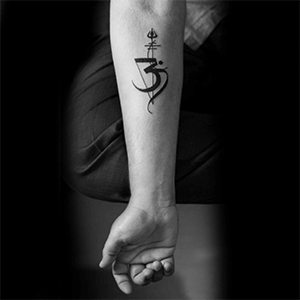 In the Hindu faith, Om is a symbol that represents the essence of the universe, and, if tattooed on your skin, it is believed to serve as protection from evil. Infinity Symbol: Infinity tattoos have taken the world by storm over the last few years. The sideways ‘figure 8’ symbol comes with the idea that there is no beginning and no end, that it can’t be broken. 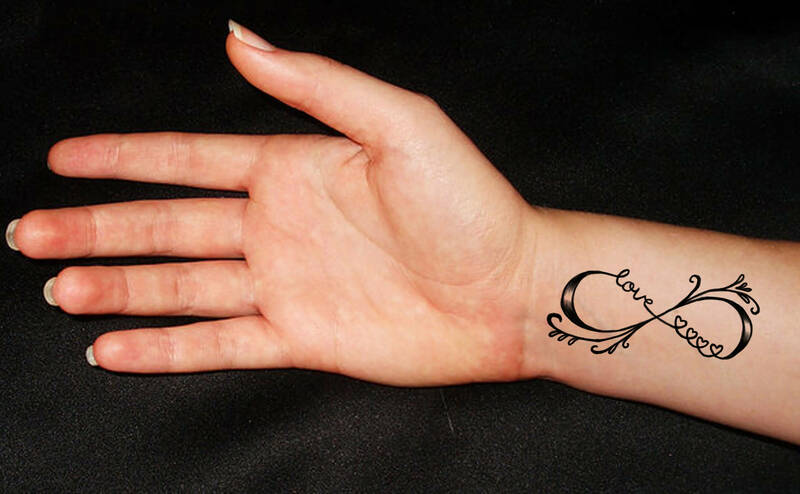 Recently, infinity tattoos have evolved to include script, to add increased meaning to the wearer. The most common scripts are love, faith, hope and believe. 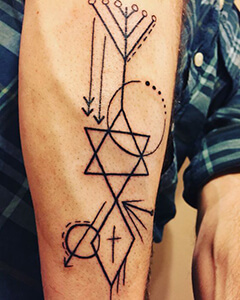 Star of David: tattoos in Judaism are less common because some believe that the Old Testament advises against them, but the Star of David has remained a popular tattoo symbol. Also known as the Creator’s Star, this hexagram star symbolizes the interaction of the Divine with mortals. 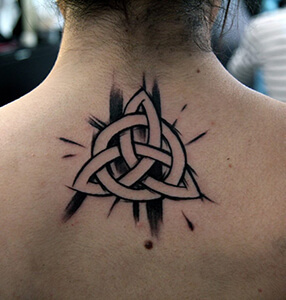 Triquetra: Triquetra, also known as the Trinity Knot, is a Celtic and Nordic symbol that represents the interconnectedness of the earth, sea, and sky. It also represents the father, the son, and the holy spirit. Water: considered an essential, life giving substance, water symbolizes purification. Wings: Flight has always fascinated mankind and has sparked myths, stories, and legends of people reaching spiritual levels that allow levitation and the invention of devices that allow one to glide freely among the clouds. When humans look at the creatures that can soar high above we think of their freedom and independence, which is something all people yearn for. 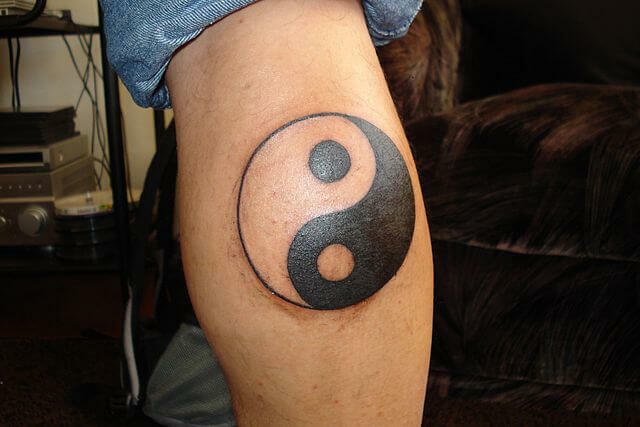 Yin and Yang: The short and simple meaning behind Yin and Yang tattoos is perfect balance. Most of Chinese philosophy starts and ends with the thought of yin and yang and the energies that correspond with them. 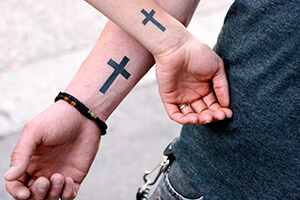 Religious or philosophical tattoos can serve as powerful reminders of one’s faith. 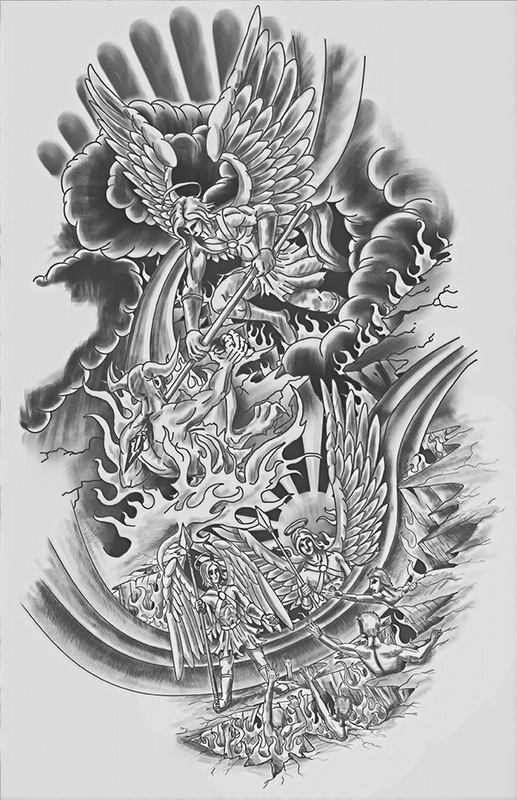 Many of these tattoo designs suggest the presence of a higher power, or stand for moral messages of love, faith, and hope. If you have any additional points to add, or if you’d like to suggest other important religious or philosophical tattoo designs, let us know about them in the comment section below! 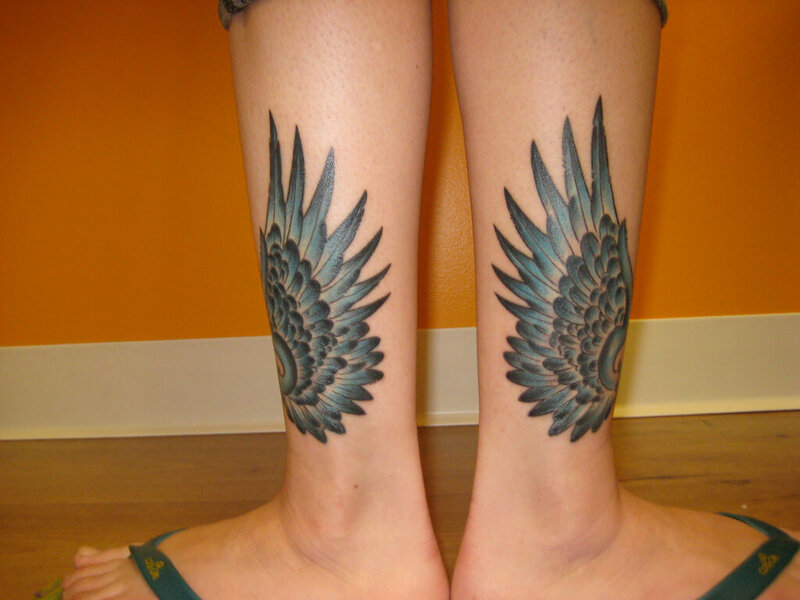 Interested in learning about more tattoo design meanings? 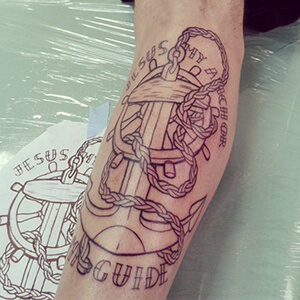 We’ve got the ultimate list of tattoo design meanings.